This is my Alfa Romeo 1750 Spider Veloce model year 1967. Picture taken in Marliana, north of Montecatini in Toscana. The 750-series or the later 101-series, the Giulietta Spider (Veloce) Equipped with a 1300 cc engine and made from 1955 - 1962. The Giuliettas have a chrome strip on the bonnet. The Veloce model has double carburettors. The Giulia Spider has an engine capacity of 1600 cc. The bonnet has a small air-slot, unlike the Giulietta. The Giulia Spider was manufactured between 1962 and 1965. The Spider 2600 Touring looks like its 2000 Touring cousin and was made from 1962 to 1965. The car was somewhat larger however and some details show that this is a '106'-series car powered by the 6-cylinders in line 2600 cc engine. Original series Coda Longa "Osso di Seppia" or the Duetto. Pininfarina designed the Duetto and manufactured these cars too from 1966 to 1969. There were three versions of the Duetto. In the US cars are referred to as Round-tails or Boat-tails. In Europe "Osso di Seppia" which means "cuttle-fish" BTW and "Coda Longa" are the identities used. Check your chassis number to see the origin of your Spider. The number is stamped on the firewall in the engine bay close to the silk-screened plate. If you register, you'll get complete access to the Round-tail register. There is a complete list over the various Alfa Romeo Spiders on the web with more details and information . Duetto numbers are here too. 1600 Duetto 1966 - 1967, 1600 cc, 109hp. 1968 3 and one single 1970. 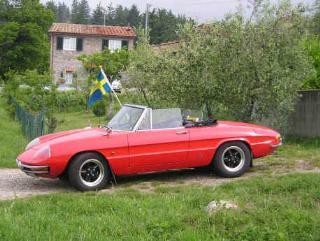 1750 Spider Veloce 1967 - 1969, 1779 cc, 118hp. 1300 Spider Junior 1968 - 1969. 1290 cc, 89hp. 2nd series Coda Tronca or the "Kamm-tail" The German Professor Kamm had made his aerodynamic studies in the' 30s, thus the name. The Round-tail was cut off in 1970 and replaced by a Kamm-tail. The difference is visible as the straight rear end of the car which contributed to the name 'Coda Tronca'. Technically the cars are close to identical, still based on the 105-Giulia. The 1600 cc and the 2000 cc models produced after 1975 are based on the 115 series, 'Giulia Nuova'. The US versions have a Spica mechanical fuel injection system. 2000 Spider Veloce US 1971 - 1982. Spica fuel injection. Total 22 059 cars with chassis number 105.24.246.0xx were shipped to the USA. 3rd series Spider Aerodinamica "Spoiler-Alfas" In 1982 the Spider got a spoiler, both in the front and back. This design was there to please the export to the USA. European market models are again almost identical to the US models. Bosch L-Jetronic, which was also used on later European cars replaced the Spica system. In 1985 the line was split into three models, the Graduate, Veloce, and Quadrifoglio (pronounced "kwah-drih-FOH-lee-oh). The Graduate was the "introductory" level of trim, with vinyl seats, vinyl top, and steel wheels. The Veloce came with leather seats, a cloth top, power windows and power external rear view mirrors, and very attractive "star" alloy wheels. The Quadrifoglio came with specially designed leather seats, canvas top, "phone dial" alloy wheels, a/c standard, special carpeting, a redesigned front spoiler and tacked-on "side skirts, and a detachable hard top. It should be noted that the cars differed only in trim, not in anything important like engine output or handling goodies. The Graduate was advertised as an "Enthusiast's Car"... i.e. it got all the important stuff, but not the gadgets or the plush things. Graduate = vinyl seats, no power windows or mirrors, steel wheels (sometime with platic covers). Veloce = leather seats, power windows and mirrors, Campagnolo "star" alloy wheels. A/C was an option Veloce, maybe on the Grad, maybe standard on the quad. Twin cams and lots of carburettors! Alfa Romeo cars have had twin overhead cams in their engine for more than 80 years. Check the twin-cam head.. So have the modern Spiders, starting with the Giulietta Spider in the '50s. The Giulietta Spider is a very attractive spider and many parts were brought along when the Giulia range was produced in the '60s. This is quite an advantage when restoring any Alfa Romeo, mechanical parts are normally no problem. Lots of vendors, my favorite is www.highwoodalfa.com in the UK. The 1750 engine has four in line cylinders, 80 x 88,5 mm giving a total displacement of 1779 cc. Max. power output at 5500 rpm was 132 SAE or 122 DIN. The five speed gear-box gave a top speed in 1967 of more than 180 kmh.